My research uses performance to re-frame maternal subjectivity and critique public performances of the family in austerity Britain. I look at a range of ‘public families’ from popular culture to deconstruct how they reinforce austerity rhetoric through the performances of their lived ‘realities’. The image is from a project called Playing Kate, where I recreate the moment when the Duchess of Cambridge emerges from the Lindo Wing, at St Mary’s private hospital in London after the birth of Prince George. 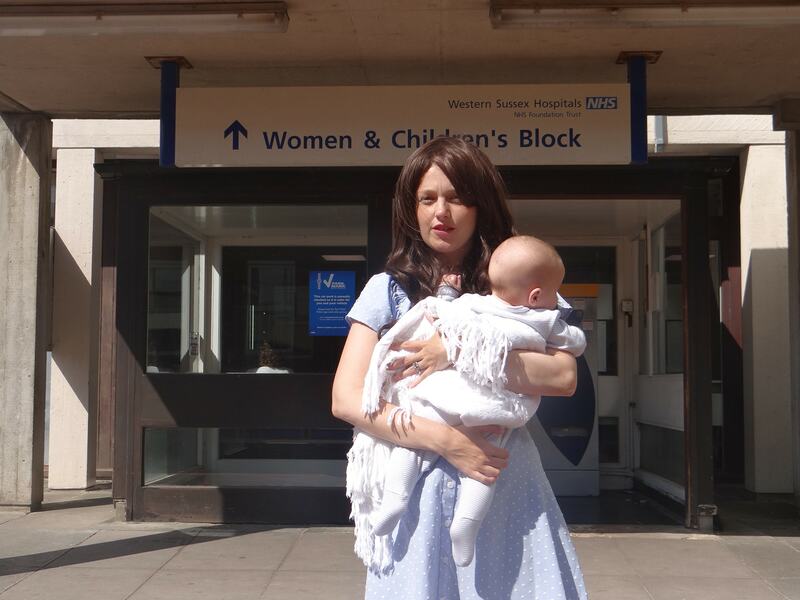 My restaging takes place with my own newborn son outside St Richard’s NHS hospital in Chichester. Conflating these two vastly differing ‘leaving the hospital’ experiences, I explore how my own maternal subjectivity is defined by the public performances of the Duchess of Cambridge. Whilst Middleton and the new Royals attempt to appear just like us, here I am performing just like her as she tries to perform just like me.